Now why is that? One reason is that human beings think with our bodies, not only with our minds — or rather that our minds are not separable from our bodies. This runs counter to the fashionable notion that we’re basically just computers trapped in carbon or spirits trapped in flesh, but there’s a good deal of research to back me up, which I am pretty sure I have in Zotero somewhere and may get around to writing up later. For now I’ll just point out that we learn through physical perception and physical action; we either were created or evolved to do so, and it is only reasonable to expect that a radical change in tools will affect the way we learn. Here’s a second theory: I type fast. I write fairly quickly, too, but I type much faster than I write, so quickly that I can type almost unconsciously. That makes it easy to copy whole passages verbatim, but it also makes it possible to ignore their content while I’m typing them. 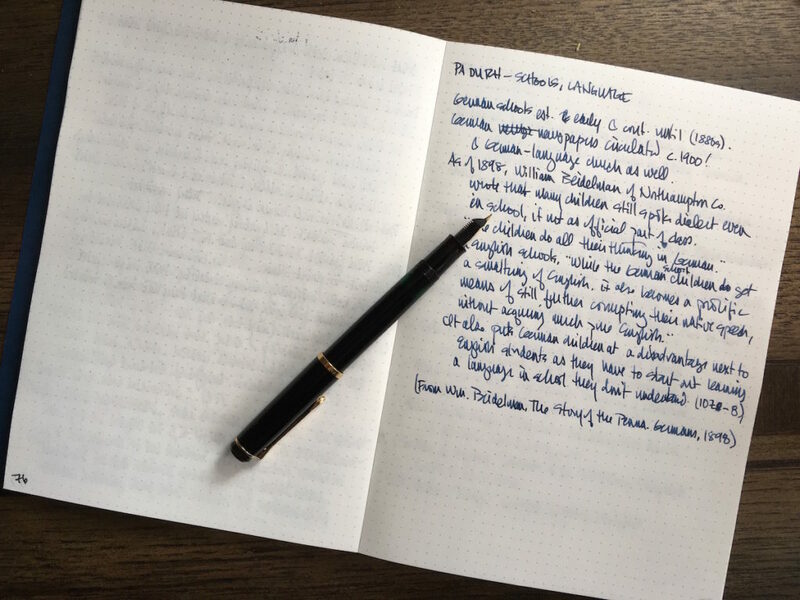 Writing by hand (and in a notebook with visibly limited space) I’m forced to be more selective, to summarize, to copy only the tersest money quotes. I have to engage more actively in what I’m reading: to digest it, weigh it, keep at hand only what will best remind me of what I need to know. That’s where the learning and remembering happen, not in the notes themselves; the notes are only notes after all, pointers to a memory already formed. And that brings me back to college classrooms. A good number of research studies showing, as Korn notes,”that students taking computer notes retain less than those who handwrite, that multitasking makes people less effective at any single task and that grades can suffer when internet distraction is an option.” All of which confirms my observations about my own learning. Notetaking in a classroom is about active listening not reading, but the idea is the same. The trouble is that college students have been raised in such a heavily digital environment and don’t know how to take notes by hand, or even to write that much with a pencil or pen. One girl interviewed complained of hand cramps. Others observed that they can’t read their own handewriting. “Students complain professors just don’t understand how hard it is to write by hand,” Korn says. Actually, I suspect they do understand: They just don’t care. It’s a skill, and there are benefits to learning it. More to the point, there there are benefits to developing the kind of active listening skills required to take good notes. Active listening demands that you actually listen to not only the words that come out of the other person’s mouth but what that person means by them, and, at the same time, what you think is important about that meaning, so that you can respond intelligently. Typing a transcript you only need to hear the words, not the meaning: you’re saving the hard work for later, by which time you’ll have lost much of the context you’ll need to do it, not to mention the opportunity to ask questions (whether of a teacher or of a text). Doing it all at once is harder, but more productive. And beyond the classroom, how many conversations would benefit from just that kind of active listening? Instead of mentally keyword-searching for the nugget we can use for our own purposes, or ignoring the other person entirely to be dealt with later while nodding and mm-hming at the right word cues? Just because a kid has been paying moderate attention since infancy to the sounds wafting into her ears (and mostly doing what she’s told) doesn’t mean she knows how to listen. It’s a skill, and not an easy one to learn. We may as well take every opportunity to teach it. So there is one more way in which computers effectively train us not to interact with one another in a genuine and productive way. As if you needed another one.